Boston Transportation Group provides limo and car service to Boston MA or logan airport from any destination in the North East as well as limo and car service from Boston MA or logan airport to any destination in the North East. We have built a reputation of exemplary car service in the New England region for all personal and corporate occasions. We offer exceptional customer service along with reliable transportation while sustaining the highest quality standards and safety measures. With our competitive prices and on time service, BTG has established itself as a top choice for car service in Boston and the New England region. We specialize in providing Chauffeured Car and Limousine services to and from boston ma or Logan Airport among many other destinations. We offer a comprehensive Fleet and product line guaranteed to fit your luxury transportation needs. Our team of leaders, chauffeurs, and dispatchers are well equipped to handle all the logistics of your trip, corporate event, or special occasion. Our strength is in delivering professional corporate transportation at value pricing. We carry Clean, late model vehicles, executive class transportation. To ensure Quality and safety. Your reservation will never be missed or forgotten by using our secure automated reservation system. Every client can access his account using a unique username and password to check his trips history or update his info. You don't need to call, place your reservation request online. Boston Transportation Group offers free transportation quotes. Professional Chauffeurs - Our uniformed chauffeurs are professionally trained to meet your personalized needs. We offer the finest transportation team dedicated to making your travel experience the absolute best it can be. They are the perfect resource for exploring Boston and surrounding cities. 24-Hour Service - We provide transportation services 24 hours a day, 7 days a week. When you contact Boston transportation Group you will speak with one of our friendly transportation specialists for complete service. Professional Fleet - We offer a diversified luxury Fleet of vehicles. Each late model vehicle is well equipped with amenities for your comfort and experience. Children Car seats - Children car seat are available for your kid's safety for an additional fee. Online Reservation System - Convenient 24 Hour Online Reservations System - Place your reservation through your computer, Smart Phone, iPad or other mobile device. Technology & Safety - By implementing the latest technologies, We are able to serve our clients more efficiently and promote safety. By tracking the latest FAA data, weather and road conditions, We stay ahead to keep you on-time. 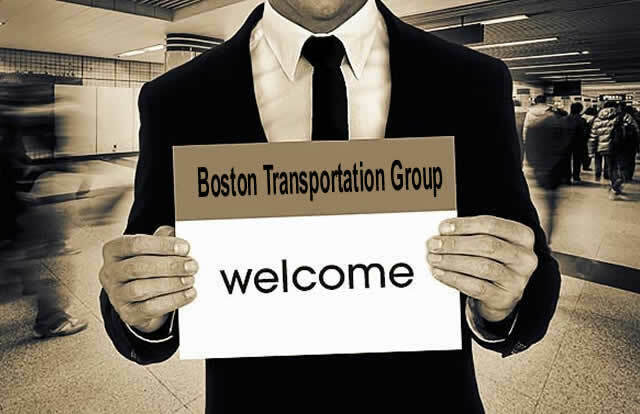 Personalized Service - Boston transportation Group pays attention to your personal needs. Each client is different and we understand just how important it is to provide detailed individualized service. We can customize our service to meet your Boston corporate transportation and worldwide service. Our primary objective - is to provide excellent service and to satisfy customers. We provide car services in the New England area as well as New York, New Jersey, New Hampshire and Vermont. Our services include airport transfers, corporate functions and events, scenic tours, shopping excursions, wedding transportation, night out, birthdays, anniversaries, prom, graduation events and more. Being Green by doing our part - BTG prides itself in being an environmentally friendly company. In an effort to guarantee ultimate comfort and customer satisfaction, our cars are always clean and well kept. Unlike other transportation companies, we are proactive in helping maintain a clean environment. Our Fleet is monitored via GPS trackers, this provides management with means for tracking unnecessary usage of the vehicle. We also monitor each car to ensure low consumption of fuel by reducing idle time. Our drivers are trained to avoid traffic that saves time for customers and conserves gas. All materials and office supplies used in our operations are recycled. Our limited print media uses only recycled paper. We avoid creating paper trails by recording most operational activity electronically. Long-Term Relation - We take pride on our past services and plan for successful future. We are always looking to meet and serve new clients as well as maintaining our existing customers. At BTG we like to build long term relation with our clients. We like to treat our customers like family and friends. After offering you a service, we would like to see you coming back. Your satisfaction is our top priority.